More leaked e-mails from Hillary Clintonâ€™s time as Secretary of State prove that she was taking foreign policy advice from left-wing billionaire activist George Soros. The e-mail was sent from Sorosâ€™ aide to Richard Verma, then the Assistant Secretary of State for Legislative Affairs who forwarded it to several of Clintonâ€™s top aides including Huma Abedin, Jacob Sullivan, and Philip Gordon. Sullivan forwarded it to Clinton. Just three days after Clinton received the e-mail from Soros the EU ended up sending Sorosâ€™ suggested nominee Lajcak to mediate the civil unrest, the BBC reported. On the 20th Hillaryâ€™s piggy bank gets a do at the de Rothschilds. As in Sir and Lady de Rothschild. As in Evelyn Robert Adrian de Rothschild and his good-looking blond Ladyship wife, New Jerseyâ€™s Lynn Forester, whose previous second husband Andy Stein once tried for NYC mayor. This de Rothschild eventâ€™s eclectic, magnanimous, open to all â€” at $100,000 per. CNN anchor Brooke Baldwin was so surprised to learn that Democratic nominee Hillary Clintonâ€™s aides destroyed her phones with a hammer, she literally couldnâ€™t believe it. Democratic vice-presidential nominee Sen. Tim Kaine (D., Va.) falsely repeated Hillary Clintonâ€™s private email server excuse on Sunday that she used just one device for her work and personal emails, when the FBIâ€™s released report two days earlier refuted that claim. â€œI opted for convenience to use my personal email account, which was allowed by the State Department, because I thought it would be easier to carry just one device for my work and for my personal emails instead of two,â€� Clinton said in March of 2015. I know they timed this FBI document dump for a Labor Day Friday to try to help Hillary Clinton, but there is a lot of material here that could (and should) come up in the Forum scheduled for September 7. The media will be scrambling to protect Crooked Hillary (especially as polls seem to be going in Trump's favor right now). A laptop filled with Hillary Clintonâ€™s emails is missing, the FBI just revealed. It makes the stink around Hillaryâ€™s private account even worse. Laptop containing a copy, or â€œarchive,â€� of the emails on Hillary Clintonâ€™s private server was apparently lostâ€”in the postal mailâ€”according to an FBI report released Friday. Along with it, a thumb drive that also contained an archive of Clintonâ€™s emails has been lost and is not in the FBIâ€™s possession. The Donald Trump campaign has already called for Clinton to be â€œlocked upâ€� for her carelessness handling sensitive information. The missing laptop and thumb drive raise a new possibility that Clintonâ€™s emails could have been obtained by people for whom they werenâ€™t intended. The FBI director has already said itâ€™s possible Clintonâ€™s email system could have been remotely accessed by foreign hackers. The WRH server continues to be under attack by Hillary's people. But the site keeps bouncing back, so if during the day you cannot connect, wait a minute and try again. Bill Clinton admitted that some Clinton Foundation donors probably gave money to the charity in order to gain influence with the former president and his secretary of state wife. Im in need of intervention.... and hopefully Trump is the one who is going to do it! Let's fix this country! Hillary thinks the law and taxes are for the peasants---NOT THE CLINTONISTAS. BY THE WAY HILLARY, $75 billion is what the government spends in less than 7 days---including weekends. Schweizer is correct---THE RICH FIND LOOPHOLES TO AVOID PAYING TAXES. A lot of them want to STAY RICH. She lies about everything so you know she (Soros Puppet)wants our guns and TPP and etc. Well, these are legitimate fears. I believe that people are rightly concerned about violence. Terrorism is part of that violence, and we have to do the best job we can to keep America safe. So Iâ€™ve laid out a very comprehensive plan about taking on the terrorists, going after them where they operate, doing everything we can to take away their territories so they canâ€™t mastermind attacks from afar. But we also have to go after them online because that is where they recruit, radicalize and direct attacks. And we need to do a better job of getting there early, rooting out people who are vulnerable and preventing that from happening. But Iâ€™m looking at violence broadly. â€¦ Itâ€™s also why Iâ€™ve advocated gun-safety reform, like comprehensive background checks, closing the gun-show loophole, closing the online loopholeâ€”because, you know, itâ€™s not only terrorists we need to be worried about. Terrorism is part of it, but gun violence kills 33,000 Americans a year. â€¦ Weâ€™ve got to get serious about stemming violence and terrorism in every way we can. We have known this for years. Michael Savage and Alex have told us over a 100 times that Hillary and Obama CAUSED ALL THESE WARS AND AND THIS MIGRATION OF MIDDLE EASTERNERS. FOR MORE INFO ON THIS SUBJECT---read GOVERNMENT ZERO by Michael Savage---PAGES 34,35,94,98,104,105,106,107,AND 150. Billionaire liberal donor George Soros told a close Hillary Clinton ally in 2012 that he regretted supporting Barack Obama over her in the 2008 primaries and praised Clinton for giving him an open door to discuss policy, according to emails released Thursday by the State Department. In an email to Clinton, Neera Tanden, head of the Center for American Progress, recounted a conversation she had while seated next to Soros at a dinner sponsored by the liberal major donor club called Democracy Alliance. Billionaire investor George Soros has signed on to be a co-chairman of the national finance council for Ready for Hillary, a super PAC mobilizing support for a possible White House bid by Hillary Rodham Clinton. George Soros: (Helping Nazis) "Was The Happiest Time of my Life"
George Soros is talking about his time working for the Nazis during German occupation in WWII. Soros worked with confiscating the land of the Jews in Hungary. He explains this experience as the "happiest time" in his life. No, you are not seeing things. He said de-Nazification. George Sorosâ€™s Open Society Institute viewed the 2015 Baltimore unrest following the death of Freddie Gray as opening a â€œunique opportunityâ€� to create â€œaccountabilityâ€� for the Baltimore police while aiding activists in reforming the city, according to hacked documents reviewed by Breitbart Jerusalem. Above is an image that you probably won't see featured on any mainstream media sites. That's because it's photographic evidence that Bill Clinton did indeed officiate the 2010 wedding of Hillary's close confidante Huma Abedin and her sexting-addicted former husband and failed NYC mayoral candidate Anthony Weiner. 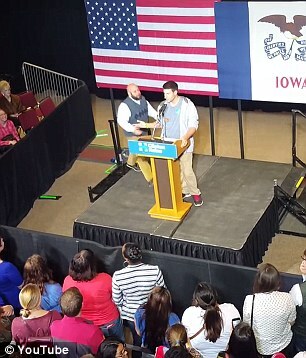 Kaleb Vanfosson, the president of the Young Democratic Socialists group at Iowa State University, spoke on stage prior to a Bernie Sanders address at the Iowa State Center in Ames on Saturday night. Footage of the incident shows Vanfosson, who was scheduled to talk about how Sanders and Clinton were uniting voters, went off-script and ranted about Hillary's flaws. Is Jill Steinâ€™s Recount an Attempt to Steal the Election For Hillary? Washington (CNN) â€” Jill Stein's bid to seek a vote recount in three key Rust Belt states is gaining steam as pressure builds among liberals to challenge the presidential election results. Hillary Clintonâ€™s lead in the popular vote is growing. She is roughly 30,000 votes behind Donald J. Trump in the key swing states of Michigan and Wisconsin â€” a combined gap that is narrowing. Her impassioned supporters are now urging her to challenge the results in those two states and Pennsylvania, grasping at the last straws to reverse Mr. Trumpâ€™s decisive majority in the Electoral College. In recent days, they have seized on a report by a respected computer scientist and other experts suggesting that Michigan, Pennsylvania and Wisconsin, the keys to Mr. Trumpâ€™s Electoral College victory, need to manually review paper ballots to assure the election was not hacked. WASHINGTON â€” The Obama administration on Friday formally accused the Russian government of stealing and disclosing emails from the Democratic National Committee and a range of other institutions and prominent individuals, immediately raising the issue of whether President Obama would seek sanctions or other retaliation. Hillary & Bill Clinton must be freaking out as the FBI closes in on their alleged illegal activity. The constant media coverage of her use of a secret email server frustrated Clinton because she insisted she â€œacted in good faithâ€� â€“ despite multiple attempts to cover up her activity â€“ and eventually admitted to making a mistake. â€œIt was like quicksand: the more you struggle, the deeper you sink. At times, I thought I must be going crazy. Other times I was sure it was the world that had gone nuts,â€� Clinton wrote. The odd remark highlights Clintonâ€™s penchant for the occult and voodoo, which were documented on numerous occasions, including rituals she performed in the White House while First Lady as revealed in the journalist Bob Woodwardâ€™s 1996 book The Choice. Long-time Clinton insider Larry Nichols also revealed that Hillary regularly attended a Witch coven in California during the 1990s. President Donald Trump told an energized crowd what they needed to do if they wanted to see Hillary Clinton prosecuted for her alleged crimes while speaking in Alabama on Friday night. CGI, which opened in 2005, will officially close April 15, 2017. Paperwork filed with the New York Department of Labor Jan. 12 confirmed the ?discontinuation,? along with the termination of 22 employees. The Jan. 12 filing makes permanent plans issued Aug. 22 by former President Bill Clinton as the family attempted to extricate itself from any conflicts of interest. ?This [group] wasn?t just for charitable ends,? Brian Morgenstern, vice president for the Manhattan Republican Party, told the network. ?As the initiative is closing its doors, you see foreign governments who had pledged tens-of-millions of dollars pulling their donations now that Hillary Clinton will not be the president. That shows a lot of people that this was more than just a charity. This was a way for the Clintons to network and really peddle influence due to their positions in leadership.? Speaking of the Clintons, Maureen Dowd had a column in the New York Times on Sunday where she now admits to just feeling sorry for ?em. This tour and Hillary?s coughing and the refusal to give up the quest just make them pitiful figures. She feels sorry for them. 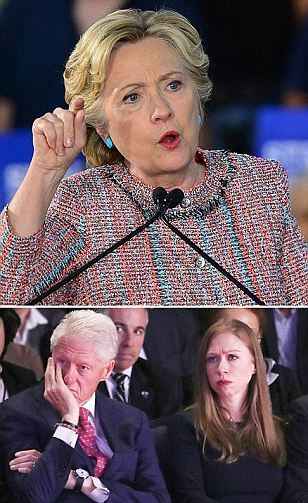 She?s calling it curtains for the Clintons. Now, who could have possibly predicted that there would be no demand to see Clintons? I think that?s right. I think I did. Now the bottom has fallen out. And they?re warning investors it was a big mistake. The left does not know what bad media coverage is. The left doesn?t know what it?s like when the referees are against them. They haven?t the slightest idea, and I doubt they could put up with it for very long at all. And I?m sure none of them, none of them could survive a week with the treatment that Trump gets. Oh the Clinton Foundation IS NOT A CHARITY ... OK ? GOT IT ? NEW YORK ? Along with filing financial reports filled with errors and misstatements, ?Big Four? accounting firm PricewaterhouseCoopers neglected to verify whether the Clinton Foundation obtained tax-exempt status for its various sub-entities, including its AIDS charity, contends respected Wall Street analyst Charles Ortel. As WND has reported, Ortel?s six-month investigation indicates the Clintons have diverted tens millions of dollars donated for charitable purposes to the personal enrichment of themselves and their close associates. He says PWC neglected to exercise due diligence in fulfilling its professional responsibilities in conducting even the most basic inquiries required of an honest audit. In his draft report, Ortel says PWC?s ?work product concerning the Clinton Foundation in 2013 is riddled with errors.? Ortel documents ?each material deficiency in appropriate detail,? but he also poses an important preliminary question: ?Did PWC, as part of its 2013 audit, establish that under applicable laws and regulations that the Clinton Foundation, including its various sub-entities and numerous charitable endeavors, many of which have been foreign based, is duly constituted as a tax-exempt organization?? PricewaterhouseCoopers has not replied to numerous requests from WND, by email and by telephone, to comment. Ortel also asked PWC a number of questions based on his investigation and has received no reply. Ortel insists the question of whether the Clinton Foundation is validly constituted as a U.S. tax-exempt organization is ?fundamental to any analysis of its financial statements. If it is not validly constituted, he says, ?the organization and its directors face substantial financial liabilities as well as other penalties that would severely impact, even bankrupt numerous parties.? ?Moreover, if the Clinton Foundation is not validly constituted as a U.S. tax-exempt organization, the legal implications for the board of directors may be severe,? Ortel writes. While the Clinton Foundation?s IRS determination letter dating back to the foundation?s creation in 2001 is not archived on the Clinton Foundation website, its 2002 IRS Form 990, Part III filing makes clear the organization?s ?primary exempt purpose? in narrowly defined terms: ?to design, construct, and initially endow a presidential archival depository to house and preserve the books, correspondence, documents, papers, pictures, and other memorability of President Clinton.? WND has also reported that the idea to morph the purpose of the Clinton Foundation from building the Clinton presidential library to fighting HIV/AIDS worldwide arose from a conversation Bill Clinton had with Nelson Mandela, which is recounted in Clinton?s 2007 bestselling book ?Giving: How Each of Us Can Change the World. ?